Absent Congressional action, the maximum Pell Grant award will no longer adjust with inflation after this upcoming school year. As costs for students continue to rise, ending the annual inflation adjustment is — in real terms — a cut to the value of the Pell Grant. As institutions of higher education and organizations that support and advocate for students, we urge you to support our nation’s students by continuing the annual indexation of Pell Grants to inflation. Pell Grants are the foundation of our national investment in higher education, giving low-income students the opportunity to go to and graduate from college and pursue careers that increasingly require a postsecondary education. This year, Pell Grants will help over 7.5 million students — including one-third of all White students, two-thirds of all Black students, and half of all Latino students — continue their education after high school1. 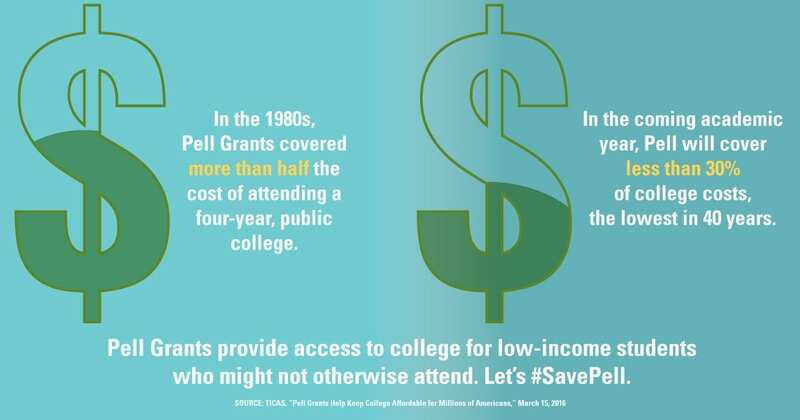 But right now, the maximum Pell Grant covers less than 30 percent of the average cost of attendance at a public, four-year institution — resulting in its lowest purchasing power in over 40 years2. 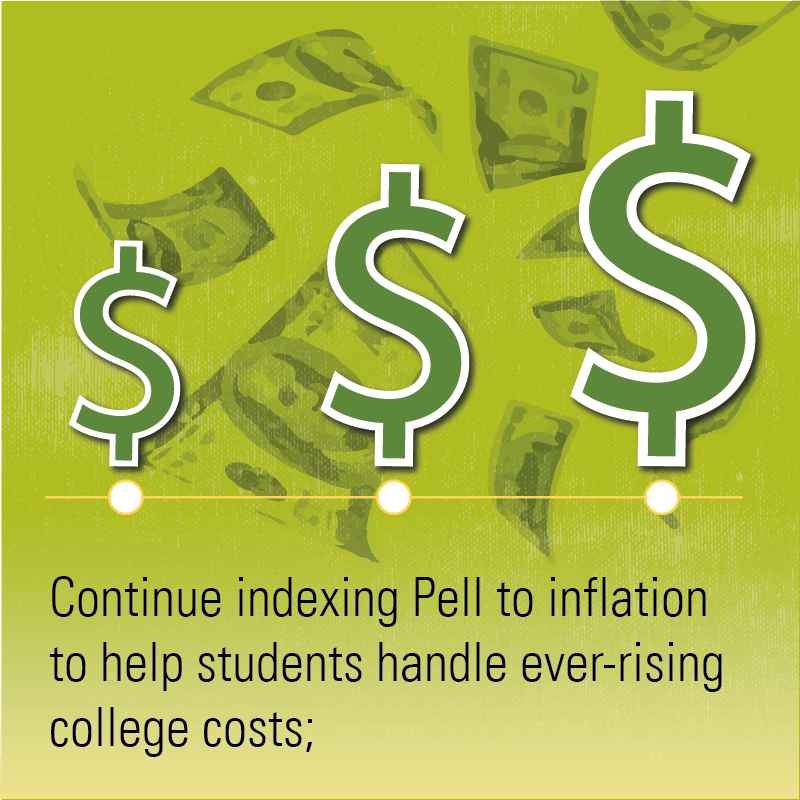 For the last five years, indexation has played a critical role in preventing further decline of the historically low purchasing power of the current Pell Grant. If Congress fails to continue the adjustment, Pell students would see the buying power of their awards reduced drastically. In 10 years, with the award frozen at its current amount, the grant will cover only one-fifth of college costs3. 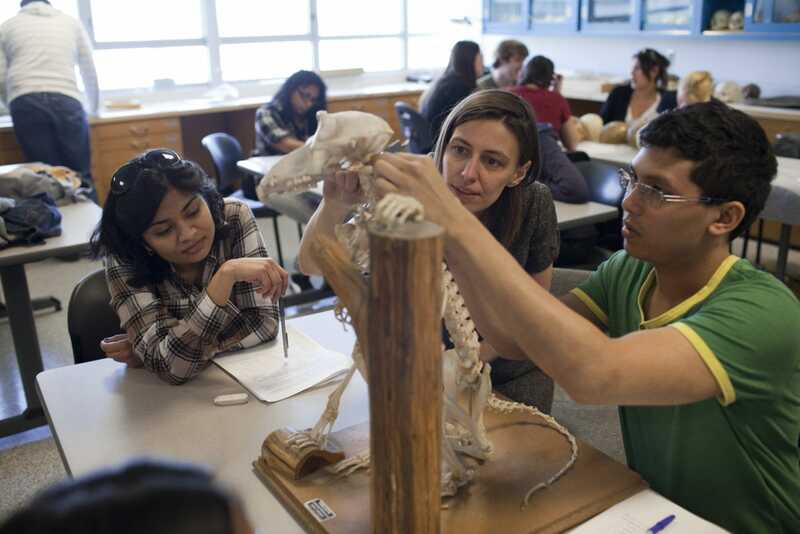 This decreased buying power exacerbates already significant financial barriers for students. In fact, after grant funding from all sources is considered, low-income students still have to find a way to finance, on average, the equivalent of three-quarters of their family income to cover their net college costs — leading them to disproportionate levels of debt4. Pell Grant students are already more than twice as likely to have student loans. Nine in 10 Pell Grant recipients graduate from four-year colleges with student debt, and their average debt is nearly $5,000 more than their higher income peers5. In this economy where postsecondary credentials are critical for pursuing a career, these financial barriers significantly limit social mobility and the availability of a skilled workforce; and we cannot afford to let the obstacles become even greater. Congress made an important investment in fiscal year 2017 by restoring access to Pell Grants year-round. But that step alone is not enough. Without action to maintain the inflation adjustment, students will face a decline in their aid. We urge you to continue the annual indexation for Pell Grants with the same determination and bipartisan support you showed for restoring year-round Pell. Thank you for your attention to this important issue. Congressional Budget Office (CBO), January 2017 baseline projections for the Pell Grant program, http://bit.ly/2mLy0nk, Table 2; and Ed Trust calculation NPSAS:12 using PowerStats. Ed Trust calculation using College Board’s Trends in College Pricing, https://trends.collegeboard.org/sites/default/files/2016-trends-college-pricing-web_1.pdf, and U.S. Department of Education maximum Pell award figure, https://ed.gov/programs/fpg/index.html?exp=0. 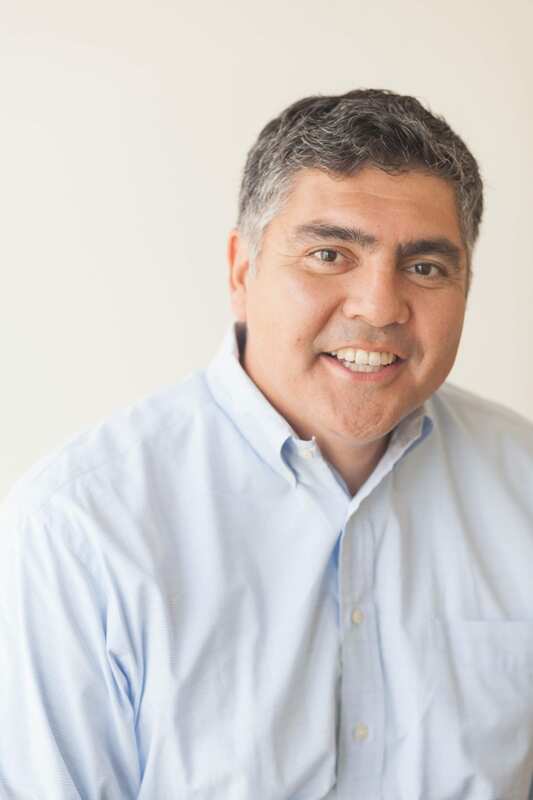 U.S. Department of Education, “New U.S. Department of Education Report Highlights Colleges Increasing Access and Supporting Strong Outcomes for Low-Income Students,” https://www.ed.gov/news/press-releases/new-us-department-education-report-highlights-colleges-increasing-access-and-supporting-strong-outcomes-low-income-students. 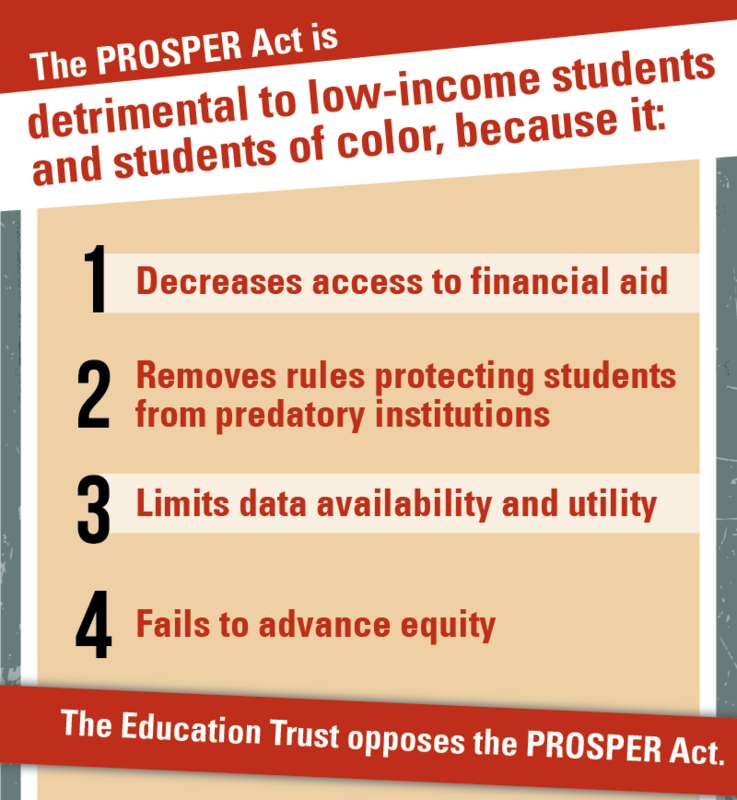 Ed Trust calculation NPSAS:12 using PowerStats. Calculations by TICAS on data from the U.S. Department of Education, National Postsecondary Student Aid Study, 2011-12.